Thu., Jan. 18, 2018, 1:18 p.m.
UNITED NATIONS – Russia’s foreign minister warned Thursday that a failure of the Iran nuclear deal, especially as a result of action by the Trump administration, would send “an alarming message” to North Korea and impact all international agreements. Last Friday, Trump kept alive the Iran agreement, which has won international praise including from U.S. allies, by extending sanctions waivers. But the president warned that the U.S. would pull out in a few months unless “terrible flaws” in the deal are fixed. Lavrov and others worry that a U.S. pullout from the 2015 deal could mean that Washington cannot be trusted to keep agreements, which could harm any future efforts to get North Korea to abandon nuclear weapons. He urged expanded diplomatic efforts to tackle what he called the greatest security challenge in the world today – North Korea. 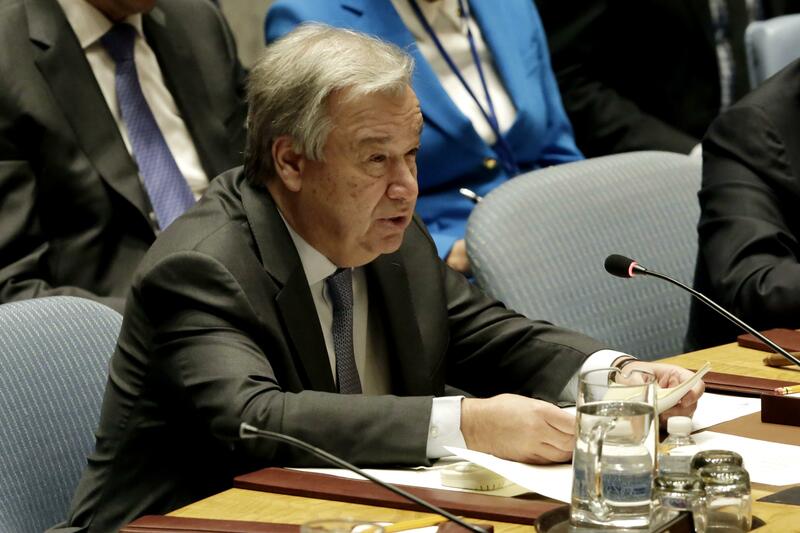 The international community must build on the “small signs of hope” from the recent contacts between the two Koreas to pursue diplomacy and denuclearize the Korean Peninsula, the U.N. chief said. China’s deputy U.N. ambassador, Wu Haitao, urged all countries to “reject Cold War mentality” and commit to peaceful solutions, including on the Korean Peninsula where he pointed to “some positive changes” emerging. “All parties should make concerted efforts to extend this hard-won momentum of reduced tension, create conditions for relaunching dialogue and negotiation and return the nuclear issue of the Korean Peninsula to the correct track of dialogue and negotiation,” Wu said. The council meeting was organized by Kazakhstan, which holds the council presidency this month and which after the 1991 breakup of the Soviet Union decided to relinquish the world’s fourth-largest nuclear arsenal. President Nursultan Nazarbayev, who chaired the council meeting, called on North Korea’s leaders to follow his country’s path. “We have built and strengthened our independent country, achieved its high international reputation by renouncing nuclear weapons and obtaining non-aggression safeguards from nuclear powers,” he said. But there was no sign of warming relations between the U.S. and Russia during the meeting. North Korea poses the greatest threat to nuclear proliferation and is continuing “its reckless pursuit of nuclear weapons … while its people starve and to threaten other nations while intimidating its own citizens,” she said. As for Iran, Haley said “the regime in Tehran is the leading cause of instability in an unstable part of the world.” She pointed to its support for “terrorists, proxy militants and murderers like Bashar Assad,” the Syrian president. The U.S. and Russia also sparred over chemical weapons in Syria. Haley accused Russia of vetoing three council resolutions and preventing the Organization for the Prohibition of Chemical Weapons from holding Assad’s government accountable for the use of chemical weapons in Syria. He said Russia is “gravely concerned about the growing threat of chemical terrorism in the Middle East, specifically on the territories of Iraq and Syria” which can spill over beyond the region. “Militants not only are using processed chemicals but they also have their own technological and manufacturing capacities to synthesize full-fledged military toxic substances,” he warned. Published: Jan. 18, 2018, 1:18 p.m.